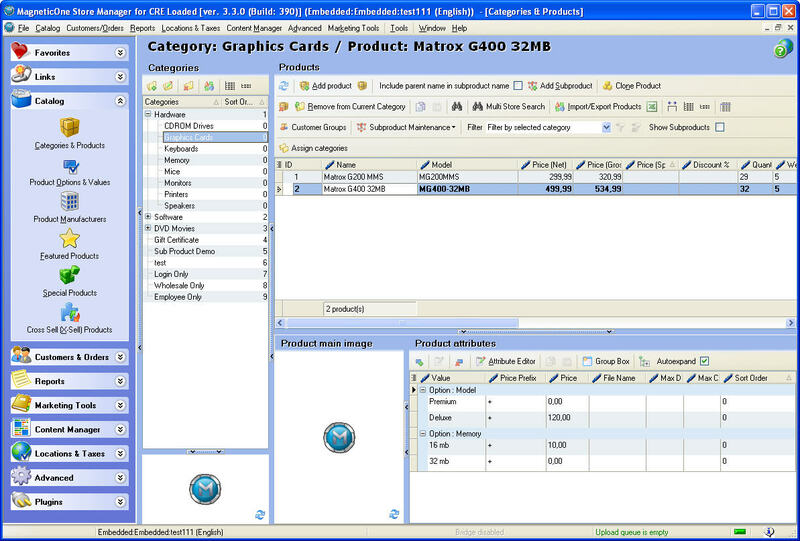 * You can manage CRE Loaded products, CRE Loaded product attributes, categories, manufacturers, orders and other things. * You can export CRE Loaded products into Excel file, edit it and then import products into CRE Loaded store - batch updates are so fast now! * You can update your store product quantities, prices and other data using file from your supplier - just import that file into CRE Loaded! * Ultimate CRE Loaded product attribute management allows you to quickly add, remove and edit product attributes in a matter of seconds with few mouse clicks. * Simple category tree with Drag&Drop supported - quickly find and rearrange products in categories using your mouse. Qweas is providing links to Store Manager for CRE Loaded 4.1.7.627 as a courtesy, and makes no representations regarding Store Manager for CRE Loaded or any other applications or any information related thereto. Any questions, complaints or claims regarding this application Store Manager for CRE Loaded 4.1.7.627 must be directed to the appropriate software vendor. You may click the publisher link of Store Manager for CRE Loaded on the top of this page to get more details about the vendor.